Brahmaputra Cracker and Polymer Ltd. (BCPL). Brahmaputra Cracker and Polymer Ltd. (BCPL), a Central Public Sector Enterprise (CPSE) is a joint venture of GAIL (India) Ltd., Oil India Ltd., Numaligarh Refinery Ltd. and Govt. of Assam. The company is setting up a state of the art petrochemical plant of Capacity 280,000 TPA at Lepetkata in Dibrugarh district, Assam at a cost of Rs. 8,920 Crores. 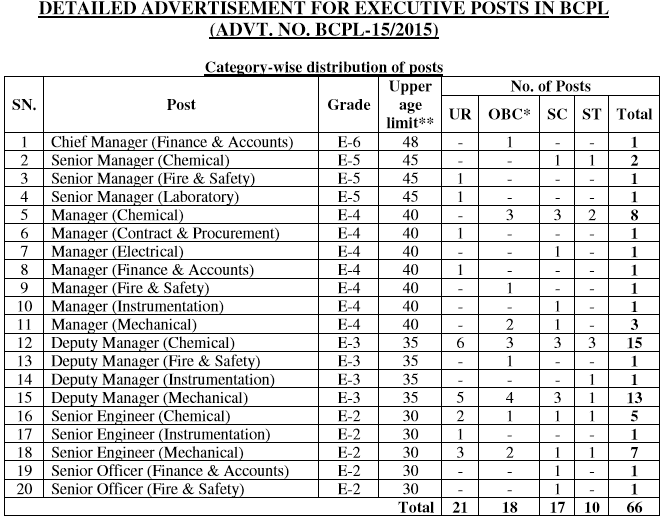 Brahmaputra Cracker and Polymer Limited (BCPL) has published a recruitment notification for recruitment of following Vacancies. How to apply: Eligible and interested candidates will be required to apply online through BCPL website www.bcplonline.co.in. No other means / mode of application shall be accepted. Before applying the candidates should ensure that they fulfill all the eligibility norms. Fee: Candidates belonging to General and OBC category are required to pay a non- refundable application fees of Rs 200/- (Rupees two hundred only). SC/ST/PH candidates are exempted from payment of above fees provided they produce SC /ST /PH certificate as applicable, issued by the Competent Authority at the time of interview. The fees once paid will not be refunded on any account nor would this fee be held in reserve for future exam / selection. Payment can be made through net-banking / credit card / debit card only . No other mode of payment will be accepted . More details can be available here: Advertisement .